Senior veterinary students at Auburn University’s College of Veterinary Medicine have begun preceptorships, working with a practicing veterinarian to gain real-world experience by applying what they have learned in classrooms, laboratory and clinical rotations. “This is the capstone experience for our students: eight weeks spent away from the college, practicing under a veterinarian in a field of their choosing,” said Dr. Dan Givens, associate dean of Academic Affairs. “This is a great opportunity for our students to grow, learn, and return with new experiences that can impact our own curriculum and practices. There is a large degree of variety and specialization among the host veterinarians as well as the choices by senior veterinary students as to the type of practice they want to engage with. Devon Duffy, from Tallahassee, Fla., for example, is attending the Hannover University College of Veterinary Medicine in Hannover, Germany, focusing on avian medicine. Dr. David Woodall, CVM ‘94, is hosting Linze DeJarnette, from Bowling Green, Ky. at the Logan County Animal Clinic in Russellville, Ky. Dr. Woodall said that the clinic has been sponsoring students and interns from multiple universities for more than 15 years. “Someone helped me out when I was learning, and I want to pass that along,” Dr. Woodall said. “The students get to see and do the things they’ll be doing every day after they graduate. Dr. Woodall’s practice focuses on equine and bovine medicine, and said that DeJarnette plans to accept a position at a mixed animal practice where she can develop a large animal ambulatory service. Dr. Lisa Plaisance, CVM ’03, owns Dadeville Animal Clinic, a small animal medicine and surgery practice in Dadeville, Ala., and is hosting Carrie Hicks, of Valley, Ala. Dr. Plaisance has been hosting Auburn students since 2008. 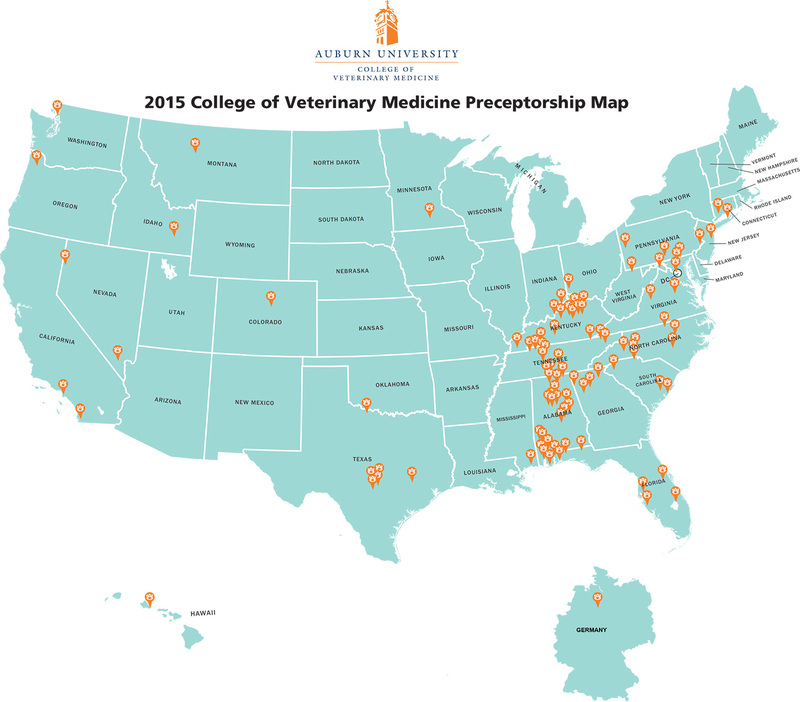 Students and veterinarians’ practices benefit from the preceptorship. Both Dr. Woodall and Dr. Plaisance said that students arrive with new ideas and concepts gleaned from the current curriculum at the college, generating excitement and increased productivity at the practice. The college also strives to ensure that the experiences students gain during their preceptorship impact the future direction of the college. Dr. Givens explained that following their preceptorship, students spend a day completing a debriefing survey, discussing all of their prior educational experience including their preceptorship. The debriefings have, in some cases, led to the college altering its curriculum to ensure optimal coverage of relevant and evolving practices in the diverse areas that a new graduate may enter. Hosting veterinarians undergo a rigorous evaluation process before they are allowed to mentor a student, ensuring they meet the high standards of practice that the CVM requires of those who will teach and mentor the next generation of veterinarians. Applicants are reviewed by a committee who determine if the applicant and the practice meet the standards to host students. Once accepted, hosts can continue to receive students for preceptorship for the next four years before having to reapply. Currently, students can choose from more than 554 approved veterinarians. If a student wishes to go to a practice not currently approved, the student may request that a potential host submit an application packet online for approval. The class of 2015 will complete its preceptorship in early May. After their successful completion of the preceptorship and debriefing, the class will participate commencement ceremonies, which will be held Tuesday, May 5, in Auburn Arena. Map that shows the distribution of our students at their preceptorship locations.